Candy apples, red candy apples coated with white flakes of coconut, the faint, sweet aroma of tropical fruit and custard cones are all things that came to mind after I walked inside 79 New Gower Street. It may be Express Café now (and not long ago Breen’s) but I remember it as Lar’s, a fruit and convenience store that achieved iconic status in downtown St. John’s. In my youth those coconut candy apples were a big attraction. I remember buying more than one of them over the years from Lar himself, a distinguished looking, portly man with silver grey hair. Lar Crocker, often with wife Winnie by his side, would stand behind the counter wearing a pristine white grocer’s apron. Crossfade to the present. Gone is Lar’s counter and shelving weighed down with ripening fruit and tin goods. Express Café is a bistro. It has the look of an up-to-date diner, with a mixture of upholstered booths and modern restaurant tables. In the afternoon and evening sun the space is inviting, warm and bright. If you remember the defunct K Café you’ll have a pretty good idea of what Express Café is all about. 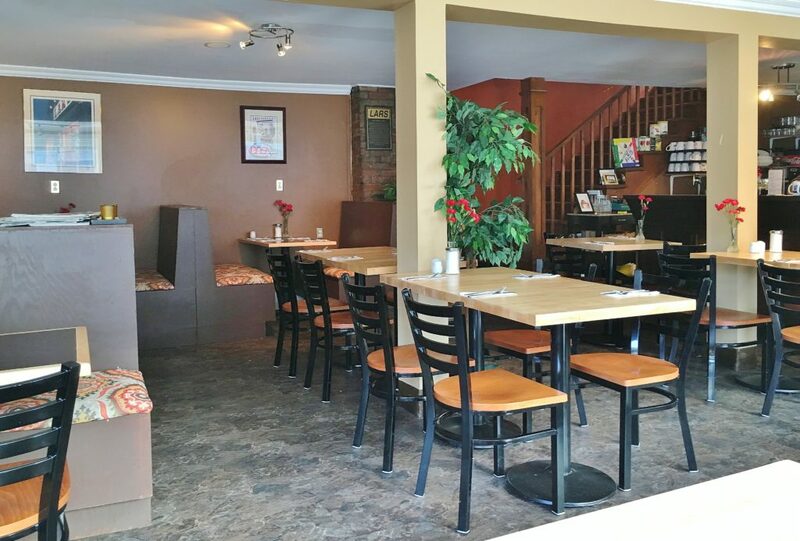 It has the same owner and as far as I could tell, except for the change in location and décor, it is K Café with a new lease (literally) on life. Sidewalk sandwich board and signs on the building itself promoted all day breakfasts, lunch and dinner. We arrived at suppertime and there was no shortage of options, including a selection of crêpes, pastas and steaks – all categories represented on K Café’s old menu. Fans of the former establishment will also recognize specific dishes like the strawberry spinach salad and garlic parmesan shrimp. Even the specialty coffees are back for an encore. 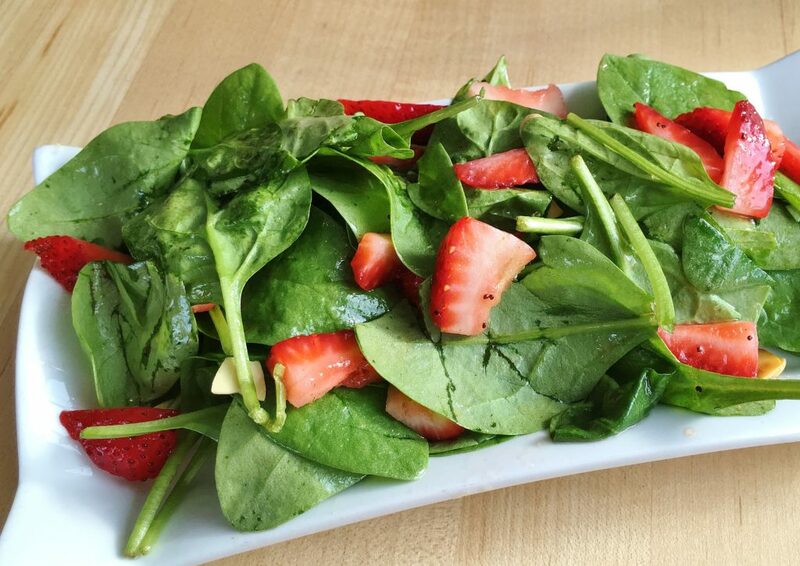 Express Café’s strawberry spinach salad was an enjoyable, standard combination of spinach, nuts and strawberries. A sweet dressing (so sweet it wouldn’t be a stretch to consider it for dessert) tied everything together. 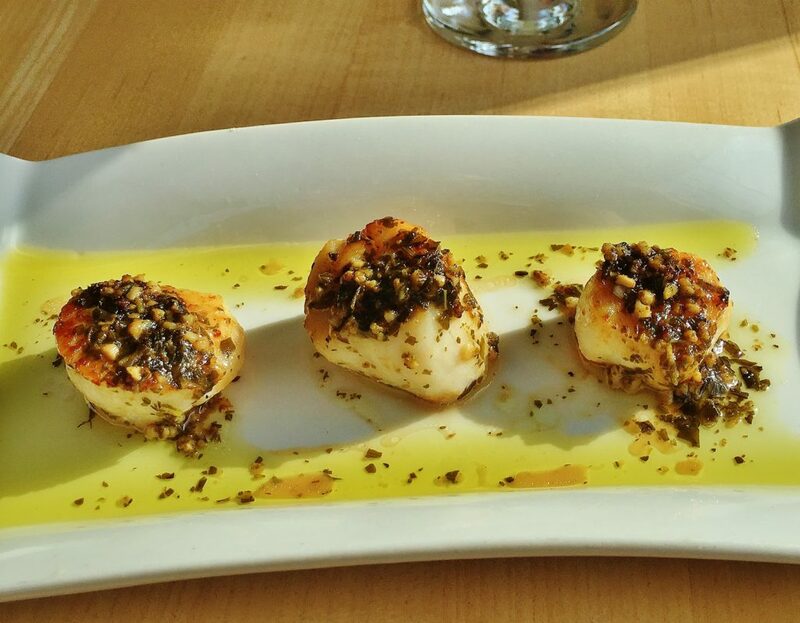 An appetizer with scallops and pesto sounded good and was indeed appealing. Each medium sized scallop was topped with a daub of pesto, just enough to constructively extend the flavour profile of the dish. Overcooking made the scallops less juicy and less tender than they should have been. Garlic shrimp with parmesan included roasted asparagus. Garlicky flavour permeated the ingredients from a generous amount of garlic butter. Parmesan crumbs of the dry, Kraft box shaker type coated the shrimp and asparagus. 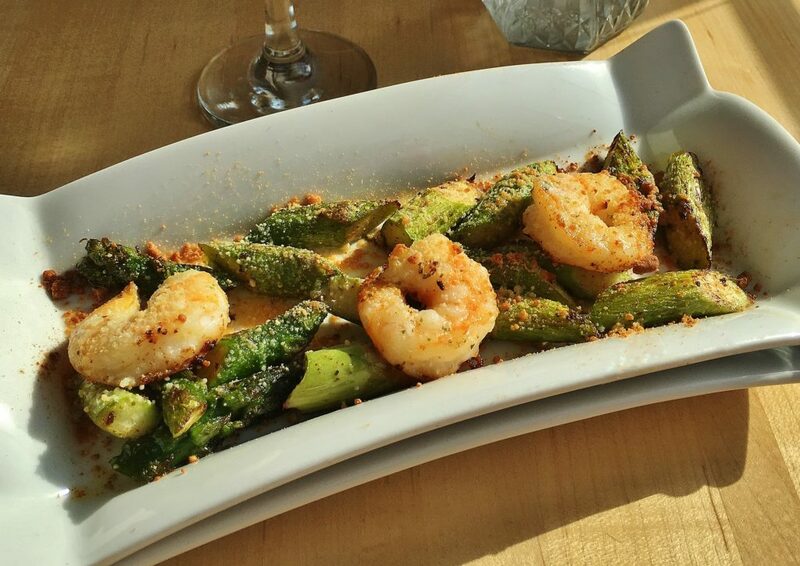 Although I enjoyed the asparagus, the shrimp, like the scallops, were overcooked. Fresh cod as well as salmon was available, cooked any way you like. 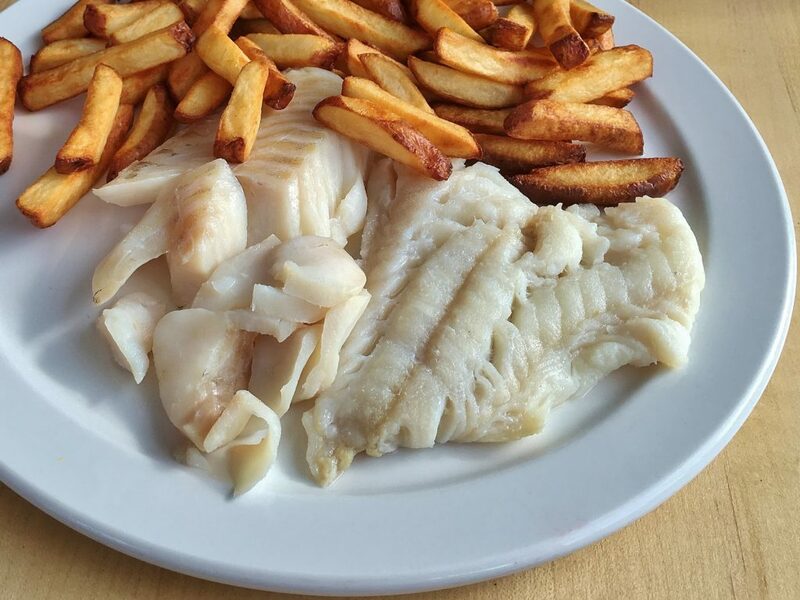 Baked cod with fries was our choice and that’s exactly what we got – a plain piece of fish, with no seasoning, and oven fries that appeared to be of the frozen supermarket variety. The cod was cooked perfectly. I was taken aback by how institutional the plate of food looked. There were no vegetables on the plate other than fries. Even the Health Sciences Centre manages to muster a few green peas for such a meal. 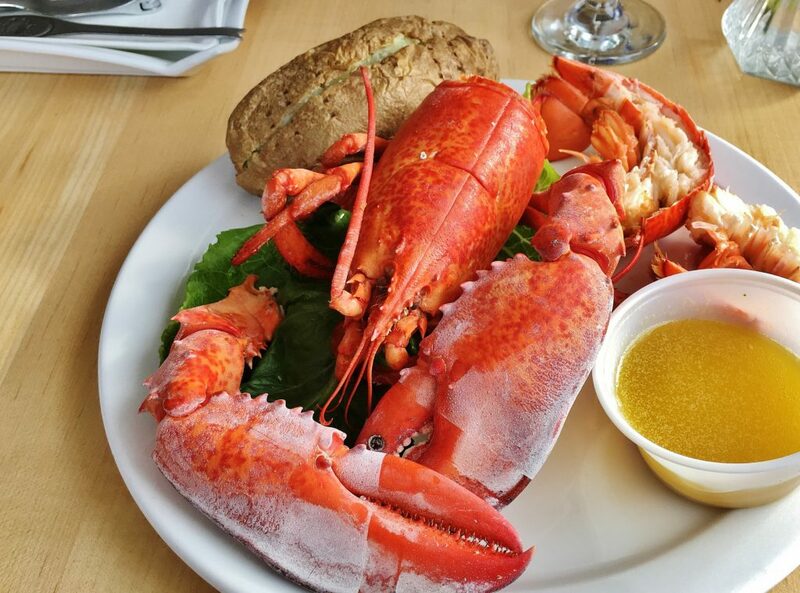 One of the standard offerings at Express Café is fresh steamed lobster. I figured a place that regularly cooks lobster should have it down to a science. I was wrong. The tail had been cut in half to reveal its contents. What should have been plump, succulent lobster meat, instead looked like shriveled threads from a mop. Sadly, the baked potato was the best thing on the plate. 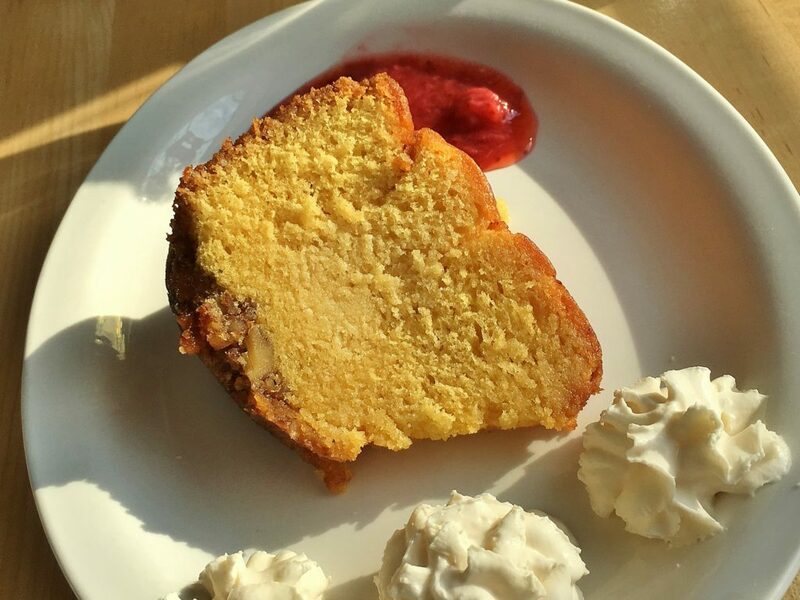 I chose Express Café’s yellow rum cake for dessert. Rum cakes should taste of rum and there was no doubt that this one did. An advantage, in addition to the bold flavour it imparts, is that rum often makes a cake moister. Express Café’s rum cake was delicious in every way, and, dare I say, almost as good as a Lar’s coconut candy apple. 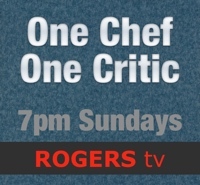 Price A meal for two with appetizers, wine, tax and tip costs approximately $90. Ambiance Warm, casual and bright. Wines Express Café has a small selection of white and red house wines. Wheelchair access Assistance required at entrance, some accessible tables, no restroom access.